KMC MissingLink 11 speed in silver. This model has a Pin length of 5,50 mm and is non re-usable. Is what it is, easy to install and remove for chain cleaning. I started using these links as a much easier and stronger alternative to Shimano's connecting pin. The pin was always the weakest part of the chain and after breaking a couple of chains at the pin these links solved the problem. I even keep one in my bike bag so I never get stranded a long way from home. Grabbed a few extras for trailside repairs. Quality looks good. Easiest way to to join a new chain. Bought as a spare, these things just work. Simple to install and remove. Excellent links, works great. I can't see or determine a difference between these and the expensive Shimano quick links. Therefore, price rules and Merlin Cycles have the best price on the planet for this product. I live in Colorado, USA. A KMC quick link that is easy. Easy to use and so convenient to connect up my new chain. Easy to use, cheap & reliable. Works fine on a 11 speed Shimano chain, shifting is normal and quiet. 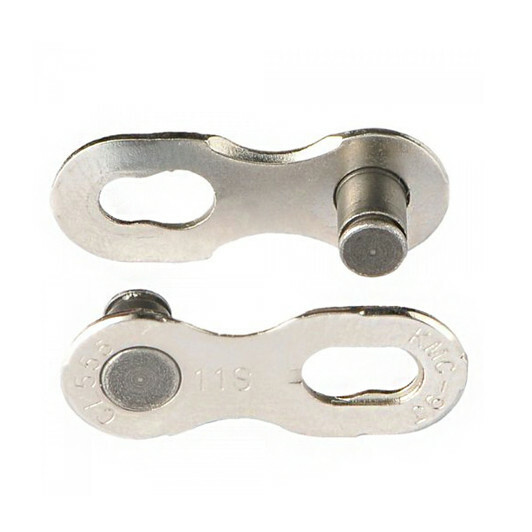 Can be closed easily by pulling the chain with your hands, needs the tool to split it. A much cheaper option to the Wipperman if you don't need tool free. I'm obsessed apparently ( so my wife says) with cleaning my chain and transmission. The only way for me is the old fashioned way, removal and washing in a bath of cleaner. The missing link is perfect, and I do re-use them. Get two, one for your toolkit ! I used it Shimano Ultegra 11 speed chain with R8000 system. Doesn`t impact any problem to system and chain. Piece together the 2 piece link, and pull either side of chain apart. It will connect with click. Easy and convenient to use. A good product. Love the missing link. Much easier than dealing with pins. Would recommend the chain pliers to remove. They work great, easy on and off with the KMC tools. They help to keep my chains clean. Good reusable link for 11s chains. Will never again use the old school chain pins. No issues when used to reconnect a Shimano HG701-11 chain, works flawlessly. Easy to use and quick/simple to undo with the correct tooling. This is now my go-to chain link.....no more messing with pins. What can I say, must have product, it compatible with shimano and Sram chains, its lot cheaper than the shimano link and I never had any issues with any kmc missing links in the past, hopefully this would not change. Use this instead of Shimano pin. Easy to fit. Fantastic! Don't know how I managed without this before. No fitting instructions but nothing that I couldn't find on-line. Great price with a discount. Easy to fit and carry an extra one or two for that horrible moment your chain goes pop. You still need to carry a chain tool to take off the busted link. Much better than old fashioned pins. I lost one of the missing link parts on my KMC X11 chain when cleaning it. These fit and do the job perfectly. Fast free delivery. I fitted these to a Shimano chain as they were much cheaper than the Shimano quick links. They were easy to fit and have had no issues so far. Works great on KMC and shimano chains. Always like to keep one with me on rides in case of a broken chain. One of the best get-out-of-jail-free (well, very cheaply) products you can get. Bought for a KMC 11 speed but it fits most manufacturers chains - snaps shut easily with a quick stand on the pedals, and off you go again. I bought spares as they are so cheap and I had donated my last one to an experienced rider who didn't know you could fit such a product. A must-have - probably the smallest, cheapest but most important spare you should carry. This is just what you need if your chain snaps I hope never to use it but if I do then I have got one, in the bag for the trail. Missing link fitted to 11sp chain quickly & easily. Very happy with this product & service. Bought this to connect a Campagnolo chain without the need for a Campagnolo chain tool. You will need a pair of chain pliers to loosen it but these are pretty common and cheap tools compared to the Campagnolo chain tool. It also recommends using a specific tool to 'connect' the link but I have found a few times that just tensioning the chain with the pedals is enough for the link to snap into place. Single use link so buy a few! Certainly more convenient than installing a pin, especially in the event of a broken chain on the road. Good to have on hand for a repair or quickly installing a new chain, since they work with several brands including Shimano. Merlin's price was very reasonable. Standard shipping to Canada took about 2 weeks. After reviewing various websites for these links and getting conflicting reports as to whether they fitted a Shimano chain, I found these on Merlin and they confirmed the compatibility with Shimano. Items arrived very promptly and were exactly as described - and they fit! Well they work fine but as they are non-reusable they are an expensive pain compared to the old 10 speed version. Nothing to do with Merlin though good price from them and fast delivery as always - KMC are responsible. Bought a few of these to keep at home and in my saddle bag. Found them very useful when a chain broke during a ride.